Jamie Lee Curtis has been a cornerstone of the Halloween film franchise since it began 40 years ago, but she's isn't sure of her place in it moving forward. 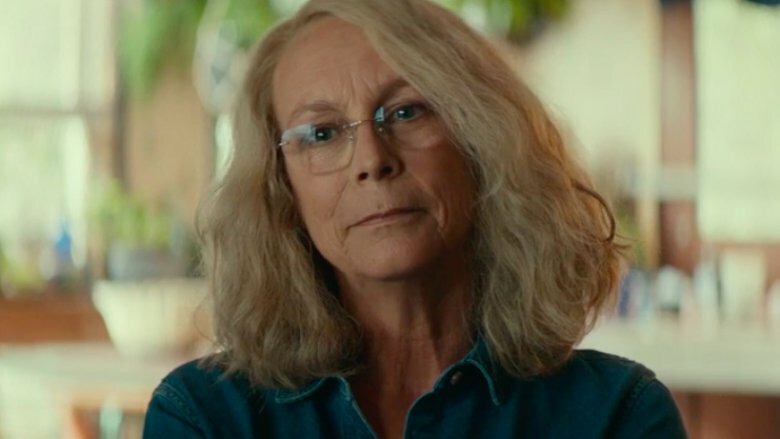 Speaking with Entertainment Weekly, Curtis, who recently reprised her role as Laurie Strode in the David Gordon Green-directed Halloween film, admitted that she doesn't know whether she will return for a potential Halloween sequel. Asked if she would star in another installment in the hallowed movie series, Curtis shared, "I have no idea at this point, today, I have no idea. I would make an assumption that, if David Gordon Green has a story to tell, that the people involved with the movie would encourage him to tell it." She added with a laugh, "I haven't been told whether or not he has a story to tell and whether or not he would include Laurie Strode in the telling. Really, time will tell. I know David is a busy guy." But rest easy, Halloween enthusiasts — just because Curtis doesn't know for sure whether a Halloween sequel is set in stone or whether she'd have a part in it doesn't mean that she isn't 100-percent down to play Laurie another time. The actress assured that she'd "be happy to do it," especially after the wonderful time she had filming this year's Halloween. "This was an extraordinary experience. David was a fantastic director, writer, but obviously this 2018, 40th anniversary, was Laurie's story, and obviously there are now other people's stories that would need to get told," said Curtis. "But Laurie's story was told beautifully this year, and I would have no way of knowing how they would incorporate her into future." As those who have seen the film will know, Curtis describing the way Gordon Green handled Laurie's narrative arc in Halloween as "beautiful" is definitely warranted. (Those who haven't yet caught the pic, avert your eyes now — spoilers are ahead!) The film, co-written by Danny McBride, picks up four decades after John Carpenter's famous original, and depicted Laurie as a twice-divorced, time-hardened, heavy-drinking shade of her younger self who spent her adulthood dealing with post-traumatic stress disorder that resulted from her first face-off with her serial killer brother Michael Myers, and training to prepare to kill Michael upon his inevitable return to Haddonfield. When Michael does show his face (or should we say mask?) in the small Illinois town again, Laurie has a plan in place. The only problem is that nearly everyone brushes off her warnings, only listening to her concerns when their fates have seemingly already been sealed. In the end, though, Laurie, her daughter Karen (Judy Greer), and her granddaughter Allyson (Andi Matichak) attack Michael and trap him in the basement of Laurie's home. Laurie then lights her house on fire, and the three generations of Strode women escape in a pickup truck as the home — and Michael inside it — burns to the ground. At that moment, Laurie succeeded in her endeavor and finally gained the closure she'd been needing for 40 years. But when the film wrapped and the credits rolled, that slightly changed. During a post-credits scene, viewers heard Michael's heavy breathing, which suggested that he had survived being burnt alive and opened the door for a possible Halloween sequel. Like Curtis stated, there's no telling how Gordon Green and McBride would bring Laurie back, especially after the amazing ending they gave her in Halloween, but at least there's room for that to happen if the pair want to do so. And they just might; McBride previously spilled that he and Gordon Green "definitely have ideas of what [they] would do" for another Halloween film, and the duo are now "being asked to figure it out" as you read this. "I think we did not allow ourselves to really indulge those ideas until the movie came out. We just wanted to put all our hopes and dreams in having this film stick the landing. But we do have thoughts and ideas of what we could possibly do," McBride said back in October. "There are definitely talks on whether we will do more of them and we're just trying to see what best makes sense." With Halloween having swept up tons of praise from critics and raked in fat stacks of cash at the box office, one thing feels certain in this sea of what-ifs: It doesn't matter what a Halloween sequel entails, fans will flock to theaters to see it.